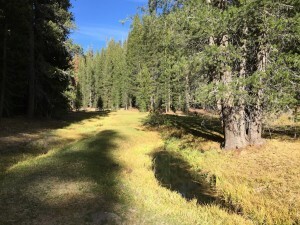 On October 17, 2014, I made my way to Sequoia National Forest in search of three species of trout: The Little Kern golden, Kern River rainbow, and the California golden. The first stop was to find the Little Kern golden. I stopped at Camp Nelson to pick up some supplies as I planned to camp at Quaking Aspen campground that night. Once I arrived at my fishing spot, due to the dry conditions it took quite some time traversing the creek to find deeper pools where the trout could be found. 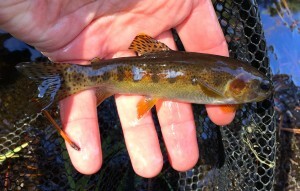 After many hours of fishing with tiny nymphs, which seemed to work best at luring the little fish out from under the shelter of the rocks, I caught and gently released a Little Kern golden. The coloring of the fish is quite amazing, especially when illuminated by sunlight. The soft golden stripe on its side and the beautiful orange color of its fins were a sight to see. © 2017 by Greg Robbin. All rights reserved.